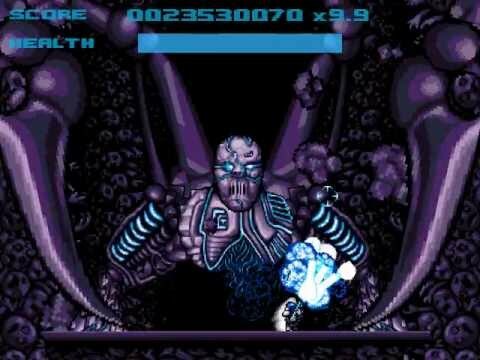 With the recent release of Level 2 The Virus Master, a continuation of the Last Chance to Reason video game, I thought it’d be fun to write about some games that influenced the concept of this project. It should come as no surprise that there was a lot of gaming going on in my apartment during writing of Level 2. In fact, an alternate title to this article could be, “Games Evan Sammons was obsessed with 2008-2011.” Each of these games holds a special place in my heart and each influenced Level 2 in different ways, be it a gameplay mechanic, graphical style, or storyline itself. The influence of Lords of Thunder on the Level 2 game is about as straight-forward as it gets. 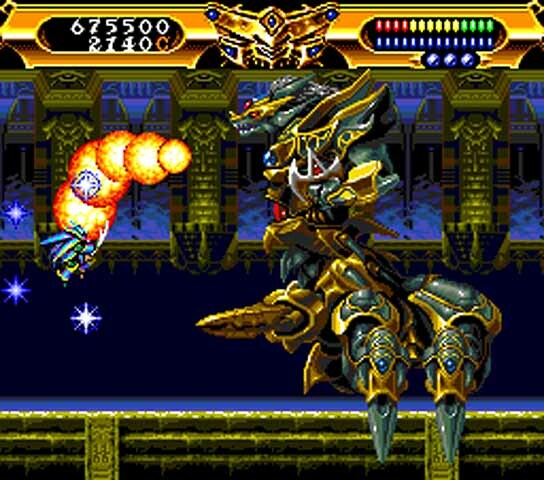 It’s an on-rails shooter featuring a heavy metal soundtrack, huge bosses and fantasy-styled environment. While the gameplay is solid, it’s the typical shooter fare. What’s unique about Lords of Thunder is the art style and music. Rather than playing as a space ship, you’re a flying dude in a badass suit of armor. Instead of blasting aliens you face a myriad of fantasy creatures. The music is pre-Animals as Leaders instrumental metal. For kids who never listened to an instrumental record before the pervasive influence of Meshuggah, that means the beats are simple and the guitars are shredding cheese. Since the Turboduo was a CD-based system, the audio quality was mind-blowing at the time. What does Level 2 have in common with Lords of Thunder? Both are on-rails shooters with a heavy metal soundtrack, for one. The graphical style and sense of scale was something we drew heavily on. We also chose to work in a 16-bit graphical style with CD-quality audio, a rare combination. Although the universes presented are vastly different (LoT being fantasy while Level 2 is sci-fi virtual reality) the limited color palette and focus on parallax scrolling backgrounds remains quite similar. It all comes down to vibe though, and both games are a celebration of metal in their own testosterone-laden ways. 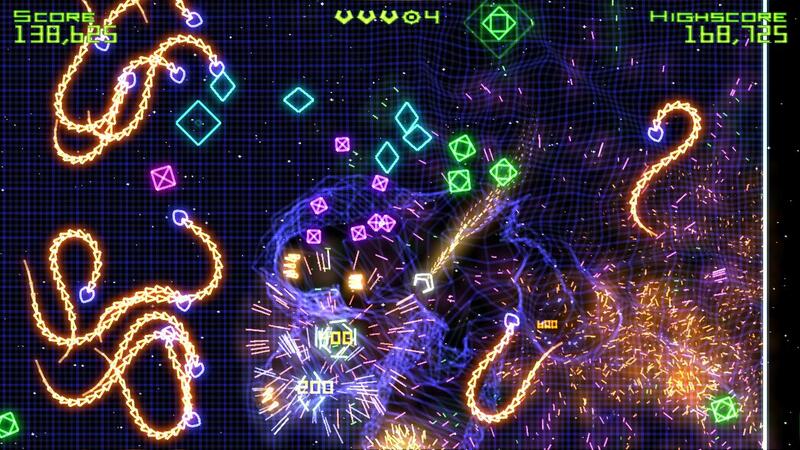 Anyone who was an early-adopter of the Xbox 360 should be familiar with Geometry Wars. This addictive game brought on a renaissance of twin-stick shooters that we are still in the wake of. The dual-stick mechanic is simple, one stick controls where you move, the other aims and shoots. So from a top-down view you have the ability to move and shoot in any direction simultaneously. Geometry Wars is far from the first game to use this mechanic, classics like Robotron, Smash T.V. and Forgotten Worlds all use the same layout. Geometry Wars rekindled the love of this mechanic to an unprecedented level, spawning a myriad of copy cats. Truth be told, I was as enamored by the mechanic as the countless indie devs that stole it. But, while we used the same control scheme (even allowing for an Xbox 360 controller to be used) the scrolling nature of the game is fundamentally different than Geometry Wars, Robotron or even Smash T.V. , all of which take place in arenas from a top-down perspective. While, Geometry Wars was the inspiration this mechanic, Level 2, was closer to a Forgotten Worlds rip-off, as both use the same controls in the context of a scrolling shooter. 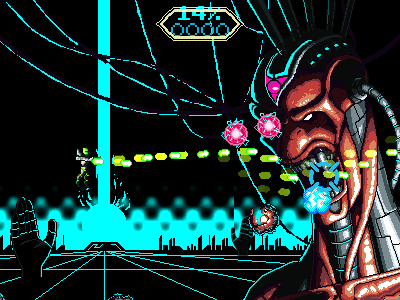 A game with a true cult following, Rez had an immeasurable influence on Level 2, the album and the game. Set in a Tron-esque computer world, Rez is a 3D on-rails shooter in which every action in the game is linked to the music. Designed to create a feeling of synesthesia in the player, every shot fired and enemy explosion creates sounds that harmonize and are rhythmically quantized to fit the techno soundtrack. The controller even vibrates to the pulse of the music. Originally released on Dreamcast in 2001, and PS2 in 2002, the game didn’t seem hit a mass audience until Rez HD was released on XBLA in 2008. Besides the techno soundtrack and 3D gameplay, there’s not much about Rez that isn’t similar in concept to Level 2. I even pitched the idea as a ‘hellish heavy metal Rez in 2D’ a few times. There’s a mysterious trippy vibe to Rez that we tried to capture in our own progressive metal fashion. There are countless things that inspire an album, video game, or any work of art. It’d be simplistic to think that inspiration for a metal album comes exclusively from other metal albums, just as it’d be silly to think a film is only inspired by other films. My flirtations with video game creation confirmed this beyond a shadow of a doubt. Music can convey images, just as film can evoke poetry. I seem to have increasingly less time for video games in my life, but its ever-evolving nature will always keep me interested in its future. Check out the next chapter of the Last Chance to Reason video game here. It’s a pay what you will download and profits will go toward continuing the project. Members of not just The Contortionist, but also Between the Buried and Me, Periphery, The Faceless, and more all teach you how to REALLY piss them off during a tour. What will their next album be like — more ExoplanetIntrinsic? The trend of bringing back old franchises is ALL bad.